Lionel Messi’s fourth World Cup ended in bitter, frustrating and all-too-familiar defeat on Saturday, with Argentina tumbling out of the tournament with a 4-3 loss to a suddenly impressive France in the round of 16. Messi departs after a frustrating tournament in which Argentina only barely escaped a humiliating elimination in the group stage. But it ended as all his major tournaments with Argentina’s senior national team have: without a trophy, and while carrying the burden of a team defeat on his slight shoulders. At 31, he may choose to make this his last World Cup. For a few minutes in the second half, it almost seemed as if Argentina’s troubled trip at this World Cup might be extended. Angel Di Maria scored a gorgeous long-range goal just before halftime, and then Gabriel Mercado turned in a low shot by Messi three minutes into the second half for a 2-1 lead. But France was simply too good. The teenage forward Kylian Mbappé won a penalty in the first half with a three-quarter-field run, and then scored two goals of his own four minutes apart to stick in the knife on Argentina. The victory will embolden French hopes that this team might just be good enough to win the tournament. France, while it had not lost a game in Russia, had been unimpressive in the group stage. Its final group game, a listless 0-0 draw against Denmark, was played to a chorus of boos. But the France that tore apart Argentina was a different team. 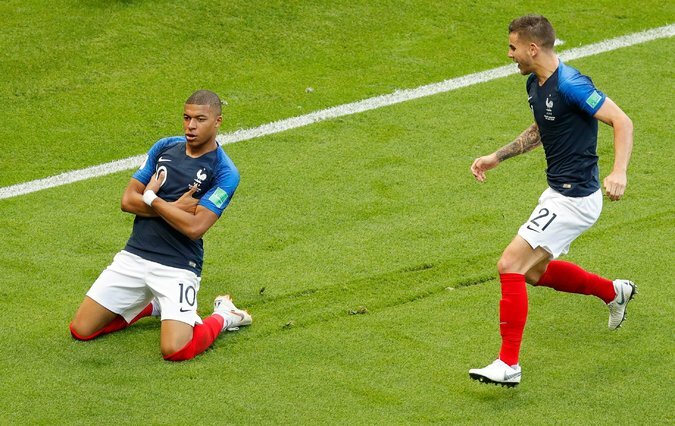 And with its core — Mbappé and Griezmann up front, Paul Pogba and the tireless N’Golo Kanté dominant in midfield, and center backs Raphael Varane (Real Madrid) and Samuel Umtiti (Barcelona) forming an unusually harmonious alliance — it might have what it takes to repeat its only triumph at the World Cup, on home soil in 1998.